Independent Financial Adviser - Really Independent? Are Independent Financial Advisers (IFAs) really independent in Singapore? "A financial adviser who claims to be so may not be telling you everything" as reported by Lorna Tan in The Straits Times Saturday, June 26 2010 article - Excuse me, are you an independent adviser? So, what is so special with the word "independent" before a Financial Adviser? With the word "independent", firms market themselves as champions of the consumers by recommending financial products based on consumers' financial needs and not by pushing or hard-selling financial products because of commissions. Is that really the case? The next time a Financial Adviser tells you he is Independent or from IFA, you may want to rethink what it really means. As defined in Singapore's Financial Advisers Act (FAA), "only financial advisers who can demonstrate that they do not have financial or commercial links with product providers that could influence their recommendations should use the term "independent". Just like perfect competition in Economics, is it really possible in the real world? The only way IFAs can be truly independent is IF they have access to all the products in the market and that is not the current situation. Most financial advisory firms actually do not qualify as independent if the definition from FAA is strictly adhered to. So some firms skirt the issue by only saying so to their customers verbally and being smart enough not to label "independent" even on their stationery for fear of being revoked of their licenses. The main issue as highlighted in the article? Volume Bonuses - which can be in the millions, given to financial advisory firms as bonuses for hitting quota of sales or renewals of specific products. The even more shocking thing? Volume Bonuses may be paid in advance when financial advisory firms make commitment to the quotas they will be hitting. Failure to hit the targets will result in financial advisory firms having to repay these volume bonuses. As the article rightly pointed out, these financial incentives may result in not so independent advice as financial advisory firms may skew their remuneration structures to fulfill their commitment to avoid returning bonuses. What makes these firms' pro-consumers and independence stance even more questionable is that often times, these volume bonuses or commissions are not transparent and are hidden from customers.Which makes it a greater hidden danger. Instead of basing your judgement and decision when selecting a Financial Adviser on whether they are independent or tied-company's Financial Consultant, judge them on their merits and professional advice. 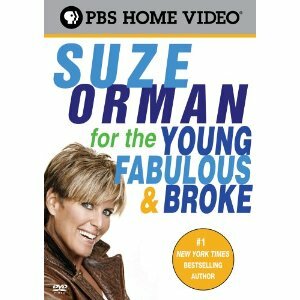 I have read about and seen Suze Orman on TV giving financial education a couple of times. Whenever I am in the library, I have seen her books, audio CDs and DVDs as well. After such a long time, I finally decided to borrow her Young Fabulouse & Broke DVD. I believe the DVD and the book is different. The DVD shows her at a talk she was giving at a University. She is of the opinion that times and circumstances have changed, many graduates if they are not careful end up Young, Fabulous and Broke with lack of financial education. Bankrupt - Don't look at them as a bad person. Oftentimes they are people who managed money poorly due to lack of financial education. I think one point to note was there was this person who became bankrupt after joining a Multi-Level Marketing (MLM) or Network Marketing organization. Sold by the potential success and payoffs, she used her credit cards to buy products and it just did not work out. It is not about MLM networks, I think it is true for any business in general. To use a credit card to start a business, you really have to take into consideration the high interest rate. Jump in with your eyes wide open! Repeatedly, the issue of pre-approved credit cards and individuals owning tens of credit cards also came up. Which is quite shocking for these are students! Which is also why I am concerned like I blogged previously, if we are note careful, Singapore may go down the slippery road of Banks Irresponsibly Promoting Credit. I think the book should be much better but the DVD was concise and easy to understand as well. 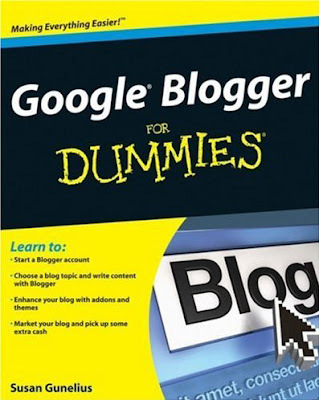 Perfect for beginners and Visual people. Do you feel like you want to stop working for money immediately?! There are thousand and one ways to earn money - as an employee, entrepreneur, businesses, investments, Forex trading, internet marketing, home-based businesses, and the list is endless. The litmus test of whether you are doing what you love? If you were to strike the lottery of $10million, would you still continue in your job? This will tell us how much you love your job. Would you continue in your job to 100 years old if do not need the financial rewards of it? This man did, working till he is 100 years old! That’s really doing what you love, isn’t it? Lucky is the man who can find a job he loves! We should all start the process to get lucky. Finding a career we love! It’s not impossible, remember this? Turning Passion and Hobby into a million dollar business..
Land Banking in the Spotlight again? - Profitable Group / Profitable Plot Is it a Scam? 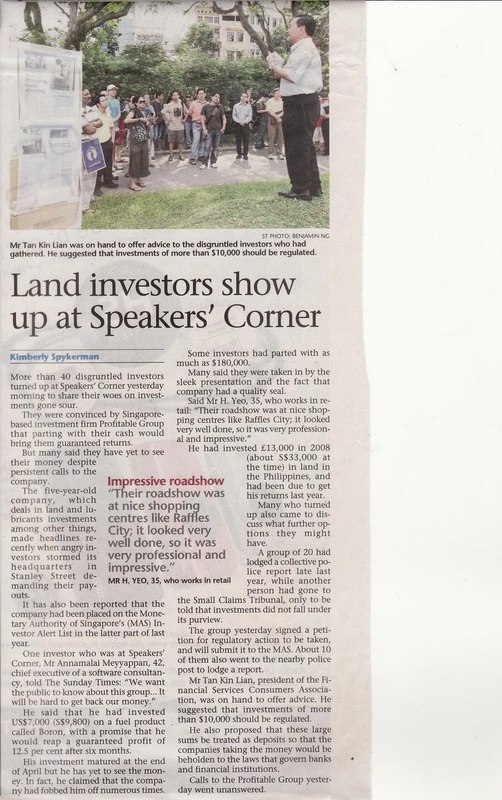 As reported in The Sunday Times June 13 2010 - Land investors show up at Speakers' Corner, 5 year-old Singapore-based investment firm Profitable Group which has dealings including land banking and Boron a fuel product, had been placed on the Monetary Authority of Singapore's (MAS) Investor Alert List in the latter part of last year. 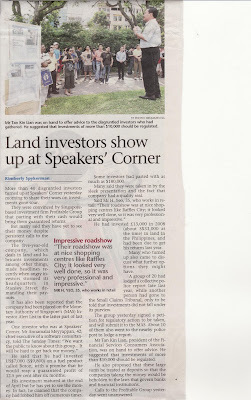 40 people turned up at Speakers' Corner yesterday in what is Part 2 of the saga. Profitable Group was also in the headlines recently when angry investors stormed its headquarters in Stanley Street demanding their payouts. The disgruntled investors revealed that they were convinced by Profitable Group that their investments would bring them guaranteed returns! Why are these investors so angry? Many have not seen the "guaranteed returns" despite persistent calls to the company. Promises of guaranteed profit of 12.5 per cent after six months were made to one investor who invested in their fuel product called Boron but he has yet to see the money despite the maturity being end of April. It is reported that some investors have parted with as much as $180,000. Calls to the Profitable Group by the journalist went unanswered. Why did people part with their money? Some of the reasons given are that they were taken in by the sleek presentation, roadshows were at nice shopping centres like Raffles City, it looked professional and impressive. That's not to say all Land Banking companies are like that but we can all learn some lessons from this episode. Always do your homework before you part with your money. Especially in lesser-known companies. "Land-banking investments involve investors acquiring direct interests in real estate rather than in securities related to real estate and, as such, fall outside the scope of the Securities & Futures Act (SFA) and Financial Advisers Act (FAA)"
You should email this entry to them or Share it on Facebook. Cheques in the letterbox! How low can the banks go? Not that anybody should be unhappy if we receive cheques in the letterbox. Keep them coming by all means! However, a reader emailed a copy of it to me and I was disgusted by what I saw and it set me thinking: Can we trust the banks to do what is right for its clients? And is a Credit Loan Crisis in the making in Singapore? A reader’s father received what seemed like a perfectly normal cheque, written in his name with the amount stated. Pleased that he is receiving money from the bank, he happily went to his child (my reader) to get help in depositing the cheque into his account. My reader was appalled when he saw the letter and cheque. Touted as extra cash at a special rate of 1.88% for six months with no processing fees! Doesn’t it sound like a bargain already? Recipients are encouraged to “take advantage of this promotion now” to “REWARD” yourself with a well-deserved holiday or “INDULGE” in something that you’ve always wanted. A bank asking you to borrow money for a holiday and pandering to your wants! Wondering what is the interest rate after six months? You have got to read through the fine print at the back to know that it is 24% per annum! So for someone who does not understand English as in the case of my reader’s father, are there safeguards in place? This is not to pinpoint any bank in particular. Most (if not all) banks have marketing campaigns for their credit and loan facilities. The tricky part is in finding a balance and drawing the line. It is a reminder that banks are not longer the service provider of just depositing and withdrawing money that we were all so used to. Mini-bonds and Lehman Brothers, anyone? Which is why, getting ourselves Financially Educated is of great importance. So we can all come to our own decisions and not have products or credit pushed to us. More importantly, I hope it is not the beginning of us being led down the slippery slope of living on credit. I remember watching on TV about the situation in US where someone who was on the verge of bankruptcy (or already one) who continued to receive pre-approved credit card in her letterbox! Again, it is really simple. Back to basics of Personal Finance 101 – differentiating Needs from Wants and NEVER borrow a single cent for Wants! So next time a mail comes into your letterbox, read carefully and think twice - thrice - before taking any loan or credit! Wealth Matters! If money isn’t coming into your pocket, money is going into someone else’s. This money saving tip can save you up to $120 per year and all you need to do is to drop your mobile telco a email or call. See the innocent looking line in your monthly mobile phone bill that reads "AutoRoam"? Usually, it starts off innocently enough. Free subscription for a few months after which the monthly fee starts. A sales strategy to capitalize on people's laziness and forgetfulness to deal with it. So what is AutoRoam? It allows you to make calls on your mobile phones when you are overseas. Some of you will be asking, "But I do go overseas occasionally, if I cancel AutoRoam, won't I be unable to make calls while I am overseas?" Well, you can still make calls overseas whether or not you subscribe to AutoRoam. Of course, if you are overseas often for pleasure or work, it makes sense to subscribe to AutoRoam if you use your mobile phones regularly while overseas. However if you are like me, you do not travel overseas very often and even if you are overseas, you do not need to make regular or lengthy phone calls, it may be better to cancel the AutoRoam subscription. Do the maths, it may save you up to $120 per year!